Nigeria for more than 50 years has been conducting elections, voting and swearing in career politicians who call themselves leaders, yet has remained stagnant and have not worked. The poor masses that voted for these politicians have been in excruciating sufferings and impoverishment even as their expectations of good representation or governance has been dashed after spending time and energy standing under the unfriendly weather to ensure they cast their votes successfully. The continuous participation of Biafrans in the legalized dubious and vicious activities in Nigeria called election and politics have not benefited the Indigenous People of Biafra rather, it has over the past years, brought death, undeserved harm, immeasurable sufferings and the accompanying pains as a result of giving their mandate to those that are supposedly representing them but did little or nothing to making sure that their lives and properties are protected. The Nigeria political community has been a system that comprises of recycled politicians whose modus operandi is to always exploit the poor masses as a panacea to ascending the throne of governance and subsequently abandon them thereafter. It is an established fact that election fraud has eaten deep like cancer in the fabrics of the Nigerian political system. During electioneering campaign, these political mafias stoop low, entering all the nooks and crannies of their constituencies with bogus, unrealisable and irredeemable promises and pledges to confuse the gullible and the feeble minded individuals, thereby luring them into coming out to vote. Most of the politicians from Biafraland are inarguably answerable to Sokoto caliphate, taking orders from them, hence fighting against their own people in a bid to defending one Nigeria and their political interest for personal embezzlement and aggrandisement. It is also the same thing with all other Nigerian political leaders who always regurgitates all the attractive agendas to cajole and lure Biafrans into submission especially now that the quest for Biafra is reverberating. However, Biafrans should know that the time to take back their sovereignty is now and must utilise this ample opportunity to restore their robbed identity. It has become crystal clear that the Biafra question has shaken and weakened the fraudulent foundation with which Nigeria was built. The tempo must be sustained without prevarication. The terrain is now heated and is set for eventualities and Biafrans have taken the mantle toward the full and total restoration of Biafra and the future generation of Biafrans will roll in the hottest furnace and swim in the most painful ocean if this generation fails to restore Biafra. To this end, in other to avoid the sudden repetition of the past and present experiences of injustice and inequality prevalent in Nigeria, Biafrans must Boycott Nigerian Elections in Biafraland and Stick To The Demand For REFERENDUM. It is the right of the Biafra people to withdraw their franchise by jettisoning and boycotting the election in the entirety of Biafraland. It is also certain that if Biafrans continuously participate in the electoral activities and other activities in Nigeria, they will definitely be seen and regarded by others including the international communities as being bereft of the tenets of freedom fighting and self-determination. When an organisation or a people is demanding for self-governance from an existing government and still partake in electioneering, they will be seen as having accepted and agreed to the system of that particular country. Moreover, as long as your vote and participation in activities concerning that country count, your quest for exit will be seen as trifling despite the cry for exit. 1. A successful election boycott will automatically disarm the gluttons and the Nigerian government puppets in Biafraland from continuing with their nefarious activities which have left Biafrans in perpetual penury and slavery. 2. Apart from your voice being heard, this action will undoubtedly prove that we are no longer in support of the existing status quo, hence, our preparedness to exiting the current state. 3. No representative will be produced in all tier of the existing government which will eventually send a signal of outright rejection to the world and the existing government of your decision to exit, which will unimpededly initiate a democratic process known as Referendum for the people to decide for themselves. 4. 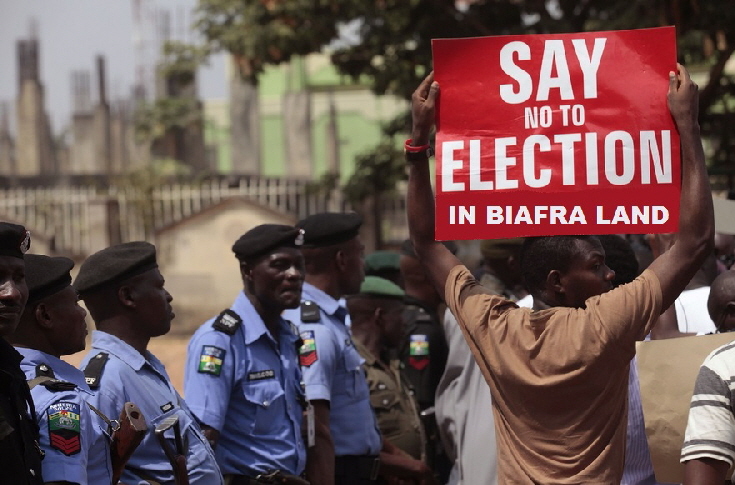 As Biafra activists, boycotting Nigerian election in the entirety of Biafraland will further hype or boost the agitation that is sweeping Nigeria today and thereby drawing the attention of the international communities to pressuring the Nigerian government to conduct a referendum. There are numerous other merits to mention but a few. One of the expected inconveniences is that either the existing government continues or a military head of state emerged. If the incumbent government continues as a result of a successful election boycott, it will violate the constitution thereby raising fundamental question as to whose mandate the government is still operating on. It will also bring about constitutional crises which will to a greater extent subject the Nigeria government into setting up modalities for a well internationally-organised and monitored referendum. On the other hand, if a military head of state emerges, the military will jettison the Constitution in handling the affairs of the nation and will be pressured by the civilian politicians and the international community to quickly organise another election to usher in a democratical dispensation which will as well be boycotted by Biafrans hence, referendum becomes the answer. So a very critical analysis on such a topical issue in a state like Nigeria will always and affirmatively be a WIN WIN for Biafrans and Referendum will be inevitable. It has never come as a surprise obviously, seeing some unrepentant individuals and politicians already making promises to making Nigeria a better place for Biafrans, thereby cajoling and forcing Biafrans to abandon the agitation for a sovereign Biafra nation and the call for elections boycott in Nigeria to become one Nigerianists. But the good and eminent Biafrans are wiser now to making sure that they take back their land in any means possible but preferably through the ballot box- Referendum. Biafrans are no longer interested in the wishy-washy bubbles of the corrupt politicians at their own detriment. Moreover, most of the governors in Biafraland are so uncouth, inept and corrupt that they always ride on the efforts of the poor masses to ascend to the position of governance and indirectly use it against the people. Take, for instance, Willie Obiano of Anambra state. He masterminded the most unwarranted killing of Biafrans at Nkpor using the murderous Nigerian security forces, who through their votes gave him the mantle of leadership he arrogates himself today. Rochas Okorocha of Imo state has not paid the civil servants and pensioners for months, yet he was elected on the platform of good governance. What of Ifeanyi Ugwuanyi the executive governor of Enugu state, who after the wanton and most gruesome massacre of Biafrans and destruction of their properties by the marauding, rampaging and jihadistic Fulani herdsmen, quickly went the Aso Villa to have a presidential handshake with the now ghost Nigerian president Muhammadu Buhari and thereafter declared fasting and prayers in the state. Were those massacred not the electorates that voted for him during the election? In short, all the Eastern politicians are stooges and puppets in the hands of the Islamic Sokoto caliphate up North. In the aspect of human development, infrastructural development, urban and rural development, equitable distribution of income and resources, the Nigerian government since after the war has not done anything as to these regards. Unemployment is at an alarming rate waging war against the teeming youth population which gives rise to vices that turn the youths to vampires and criminals. The oil in Biafraland is being used to sustain the Nigerian political elites which are detrimental to the sufferings of the poor masses. So many evils have been perpetrated and unleashed on Biafrans, hence, the need to completely boycott elections in the entire Biafraland so as to significantly drive home our unstoppable and irreducible quest for Biafra restoration through a referendum. We did it with the recently concluded and successful Sit-At-Home exercise carried out on 30th May 2017, which has destroyed the already battered image of Nigeria and the election boycott directives will finally bury her remaining carcas. I hereby humbly appeal to the good people of Biafra and Anambrarians, in particular, to strictly adhere to the election boycott directives so as to curtail the authoritative powers of the Nigerian government in Biafraland which will serve as a primary referendum that will usher in modalities for Biafra referendum.